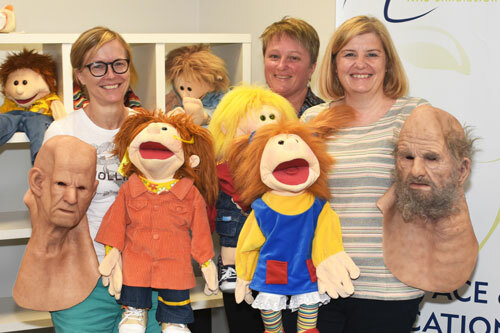 Nursing academics from City, University of London have visited CQUniversity, Australia to learn more about the use of life-like character masks and puppets in health education. Used in realistic role-play and patient scenarios, the tools can enhance student learning and help health students better understand the needs of patients. Having first heard of the innovative MASK-ED (KRS Simulation) during a conference in Italy a few years ago, City academics Janet Hunter and Karen Rawlings-Anderson went to Australia to learn first-hand from creator Professor Kerry Reid-Searl. Thanks to developments in life-like character masks and silicone body parts, health educators can now 'mask' themselves for realistic patient scenarios, enhancing student learning. Professor Reid-Searl was also able to show Janet and Karen the ‘Pup-Ed’ system which allows health professionals and educators to demonstrate medical procedures to a child, using a friendly-looking puppet. One of the puppets, known as ‘Tommy Richie', is a cutting-edge silicone design which can handle tubes and needles and can be wiped down to avoid cross infection.